The typical software developer, well at least, most people’s image of this particular species of IT worker, wears glasses, doesn’t say a whole lot, subsists on pizza and potato chips, and is most of all, unathletic. Right? Pokeshot///SMZ develops social business software, but its employees don’t fit the typical image of a software developer. As reported in September last year, the Pokeshot///SMZ team bikes some 90 miles (about 140 kilometers) to work every day. Since then the members of the staff have continuously improved their fitness thanks to their bike commutes, their lunchtime workouts and their jogging routines. Not only is Pokeshot///SMZ the most athletic company in Berlin Adlershof, but it is also the healthiest. Here’s the latest chapter in this success story. The desire to keep active and stay fit must be contagious. James, a Scottish intern, is now biking to work from Berlin’s northern borough of Pankow: “So far I’ve only needed to use public transportation once when I got a flat tire. But otherwise I enjoy the diverse route and have noticed the bike commute makes me more productive at work.” Patrick, a social business consultant, has experienced the same effect. 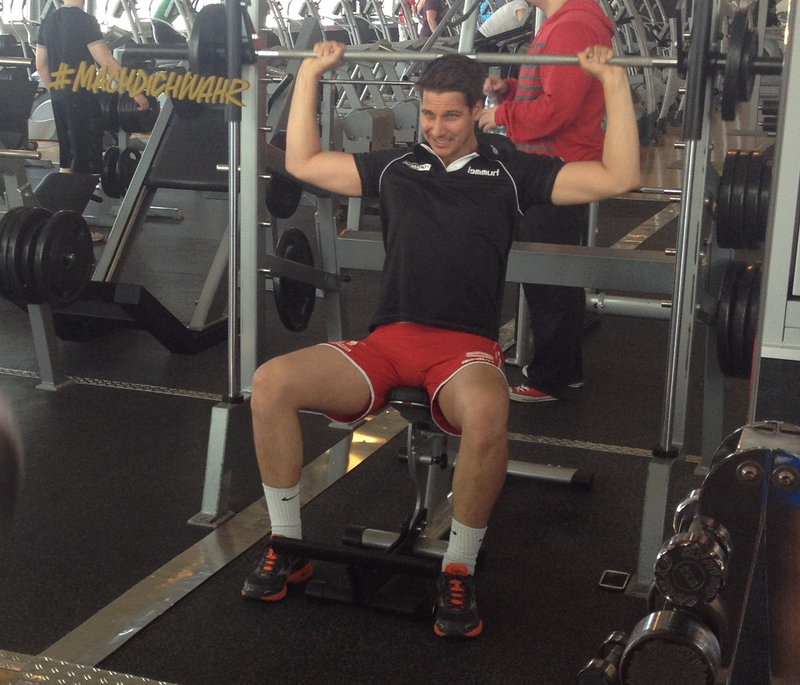 Together with Thomas, an executive assistant, he uses his lunch break to build up his muscles and stamina. “Working out during the lunch hour helps me clear my head and be more creative throughout the afternoon,” says Patrick. Christoph and Sandra, consultants who take a lot of business trips, are still able to find time in the evenings to go jogging. They especially enjoy running in the different cities they visit where there is always a new route to discover. So much exercise is only possible if you follow a proper diet. This is something Stephan, a German duathlon champion, knows best. He stays in top shape by eating lots of fruit and cutting meat from his diet, and has even influenced the eating habits of his colleagues. Even if everyone at Pokeshot///SMZ hasn’t become vegetarian, staff members have lunch together at the Adlershof organic cafeteria on “Veggie Day.” Sweets are also no longer to be found in the office. Instead, employees snack on bananas or make their own fruit shakes. 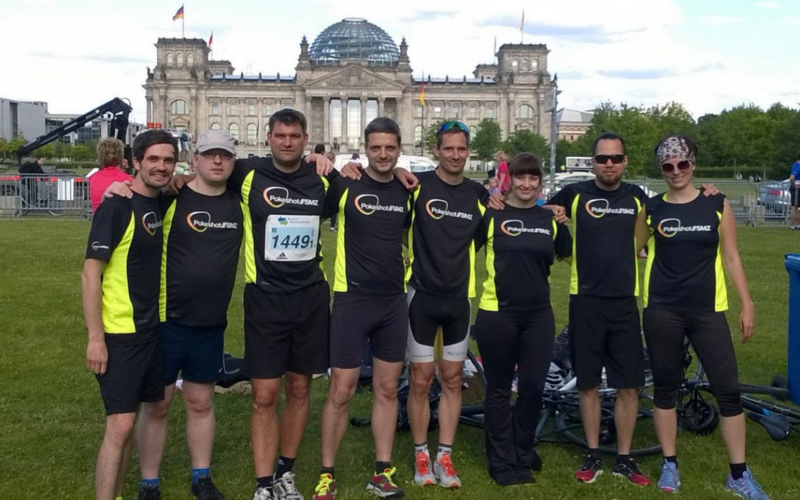 Pokeshot///SMZ’s staff recently turned in an impressive performance at the Berlin Team Relay competition organized by the Berliner Wasserbetriebe, proving that they are among the most athletic employees in Berlin. The company’s entire staff competed in the 5×5 kilometer relay in two relay teams – Pokeshot///SMZ Fast and Pokeshot///SMZ Faster. Thanks to intensive training and a great team spirit all runners crossed the finish line in good health and in good spirits. The Pokeshot///SMZ Faster team recorded an excellent time of 1 hour 56 minutes, putting it in the top five percent of the 1,900 participating teams.